Brady's white safety padlock has a 1.5 plastic shackle and is keyed different. With a non-conductive, spark resistant lock body, this compact, lightweight padlock offers superior corrosion and chemical resistance. The unique key cylinder prevents electricity from traveling from the shackle to the key, protecting workers when the key is inserted. 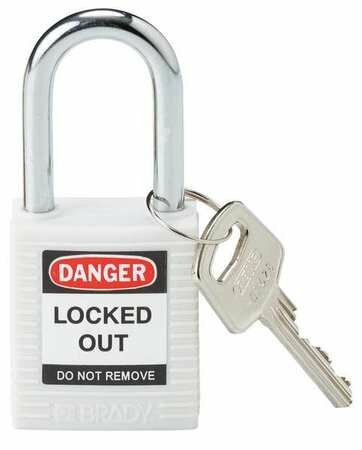 This safety padlock is sold individually, but is available in packages of six and a variety of different colors, including black, orange, blue, green, red, purple, yellow and brown.